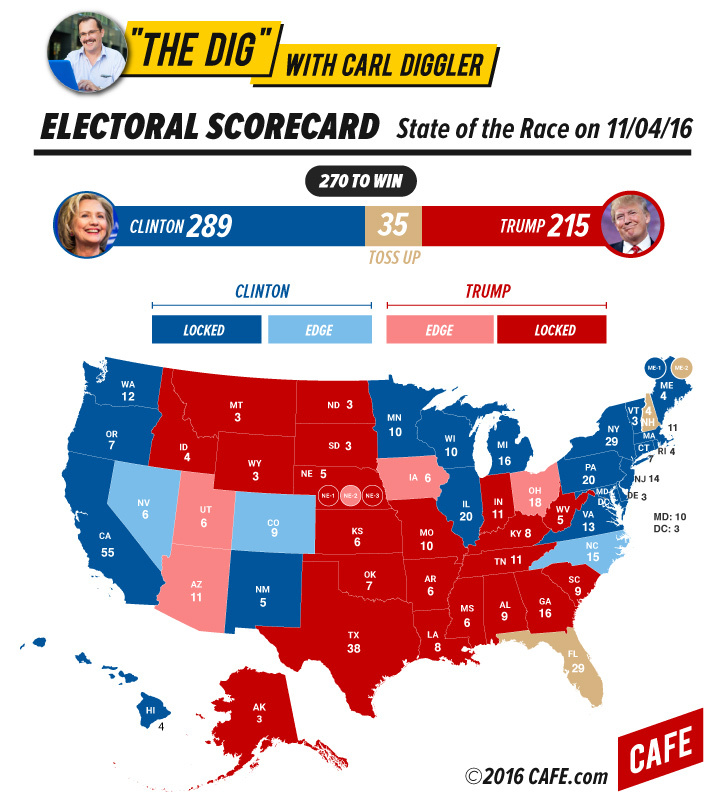 CARL DIGGLER CALLS THE ELECTION: My 2nd-to-Last Prediction Map Until the Election! Last week I posted what I said was my second-to-last state of the race forecast. The news cycle, however, decided to make a liar out of me. After FBI director James Comey announced that the bureau was reopening their investigation into Hillary Clinton’s illegal Geocities email, Hillary took a huge hit in almost every poll. Per the principles of moderation, I am not one to wildly speculate. That said, it’s exceedingly likely James Comey is likely a Putin deep cell and possibly Joseph Stalin’s secret son who was raised in America, sent to destabilize democracy and hand over all of Central Europe to the reconstituted Neo Soviet Union. Despite a likely Slavic plot to destroy this great nation, I have to thank voters for their jumpiness: you’ve given pundits like me a real race. This is real horse race hours! Smash those MF winners and losers of the week button! If the drama of Trump versus Clinton weren’t enough, there’s even more rich tapestry to this final week. I’m talking good versus evil. Gut versus cowardice. Fathers versus the involuntary celibate. That’s right: the final confrontation between Carl Allison Diggler and Nathan Silver’s numbers virgins. Cool, Nate. Keep on trucking. How’s your FiveThirtyEight colleague Harry? I don't want to say this game is making me nervous, but I'm now mixing my root beer and my cream soda. One just isn't enough. I started free style rapping and @jodyavirgan stopped me. He is stifling my creative side. Six days. Six days. Six days. Six days. Six days. Six days. Six days. Six days. Six days. Six days. Six days. Six days. Six days. Six days. A “Lock” indicates one candidate will certainly win. An “Edge” means one candidate is on track to win, but the margin is close enough that late-deciders can change the outcome. A “Tossup” could go either way. Evan McMullin seemed like he could have made history and scooped up enough disaffected Mormon conservatives to turn Utah purple. That was until a genius robocall campaign from a white nationalist farmer informed Voters that the former intelligence officer a gay virgin with a gay mom, and that Donald Trump “respects women.” Whoever made the ad is familiar with Mormon voter issues: McMullin has had fewer girlfriends than I have in the last 5 years (even with my busy schedule and discerning taste), and that looks straight up terrible to coupling-obsessed LDS voters. Look for Trump to bank on McMullin’s possible virginity and score all 6 of Utah’s sweet electoral votes. I hope it was worth it for Hillary to gloat over her precious sporpsball, because it definitely alienated Ohio voters. All these people had to live for was the possibility of their team of millionaires who hate them winning a shiny trophy, and it didn’t happen. Now they have to go back to their disgusting, corn-fed lives, but after the Democratic candidate rubbed salt in the wound and reminded them that they are losers. Truth is truth, Secretary Clinton, but maybe have some tact before they go to the polls? We all know Hillary is a diehard Cubs fan who religiously watches all the games on an iPad held by her aides, but Illinois isn’t even in play this year. The proper, No Labels thing to do would have been to stop watching when the game was tied and declare both teams winners. Or, better yet, to avoid altogether physical sports, a game played by sweaty meathead jocks who haven’t the slightest understanding of the winners and losers of the week, and instead watch the thrilling full contact experience of lower court confirmation hearings aired on CSPAN-3 and legislative public access networks nationwide. North Carolina remains slightly in Hillary’s column despite African-American early voting turnout being down compared to 2012. Clearly African-Americans who came out in droves to elect and reelect the first black President are not yet excited for Hillary and her policies of a Social Security grand bargain and No Fly Zones over most of the Middle East, policies that are perfectly tailored to appeal to deficit-minded urban voters. So why am I so confident about Hillary’s chances? Because her crack team is on the case. Folks, this may go down in history as the Daisy ad of 2016. Lena has concocted the perfect blend of hip hop music and election year snark that will have urban voters practically dancing to the polls. I know I’ve been blasting “Sensual Pantsuit Anthem” out of my boom box in Park Slope, and if I had a window in my apartment I bet I’d see a lot of folks on the sidewalk boogieing down to the beat along with the Dig. By crafting this fall’s official epic jam at the low production cost of $50,000,000, Team Hillary has shown yet again that they have their fingers on America’s pulse.